Let’s Take A Walk In The Koala Forest! You read it right. The koala forest. Because things are this magical in Australia – until you’re eaten up by a crocodile. But wait, we’re in Victoria’s Great Otway National Park, crocodiles are far away from here, up in the North. Here you could only bump into venomous spiders and snakes – or koalas! Of course, there’s no such thing as a koala forest, we made that up. They are called eucalyptus or gum tree forests. 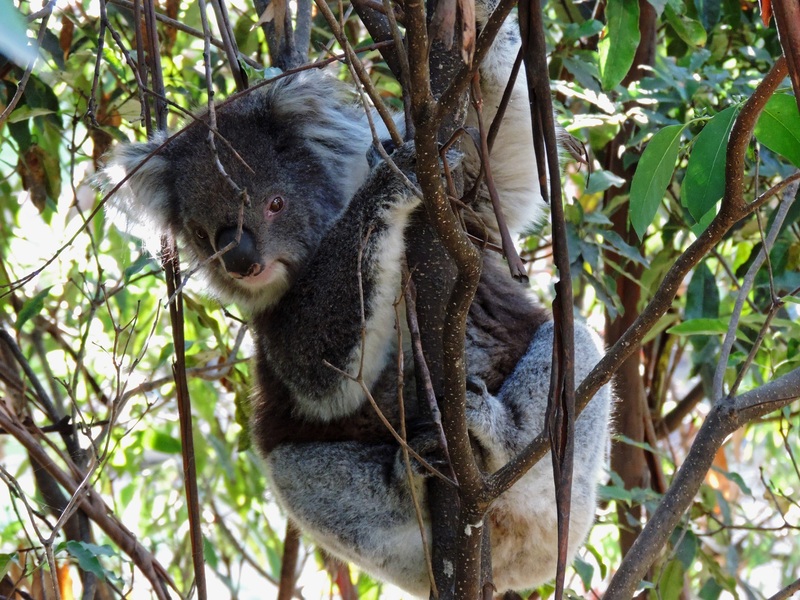 But some of them are home to a great number of koalas, and we are here to show you one of these. 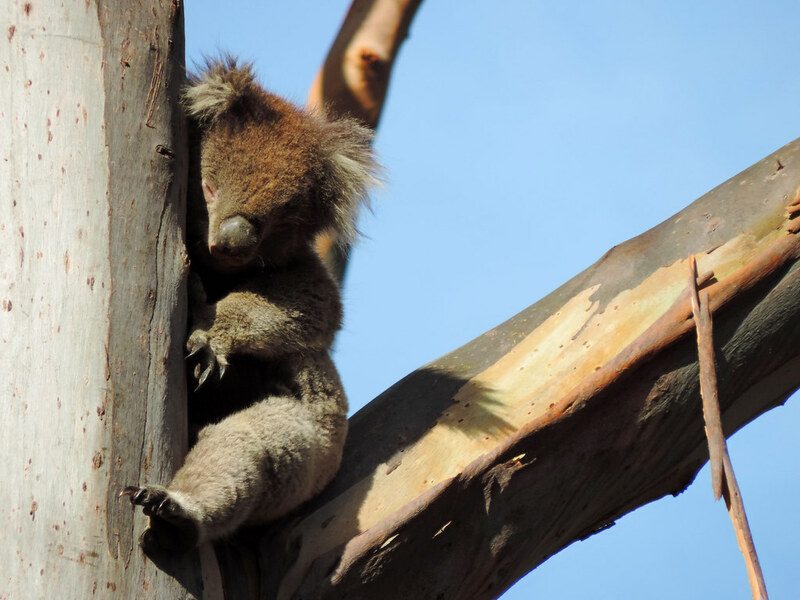 Where to see koalas in the wild? 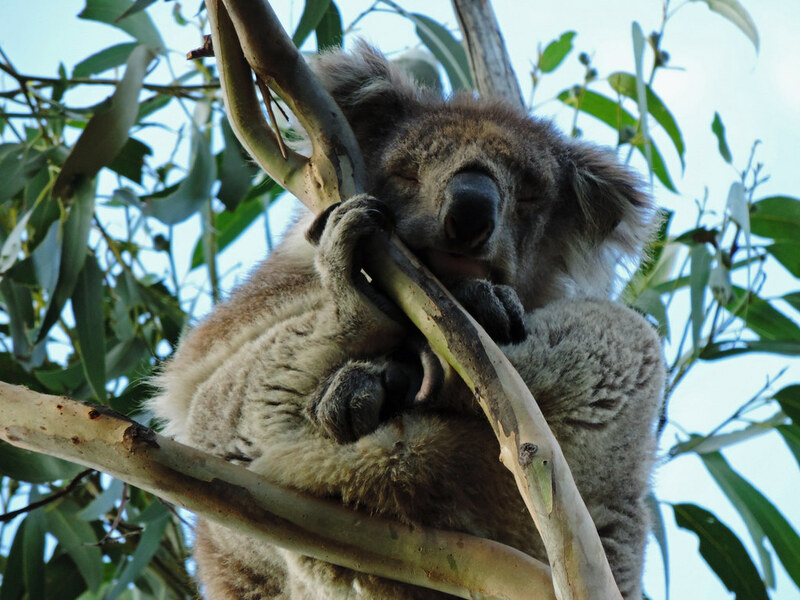 Koalas don’t live everywhere in Australia. Their habitat is the southeastern and eastern part of the continent – the states of Queensland, New South Wales, South Australia and Victoria. And they are not the easiest creatures to spot. 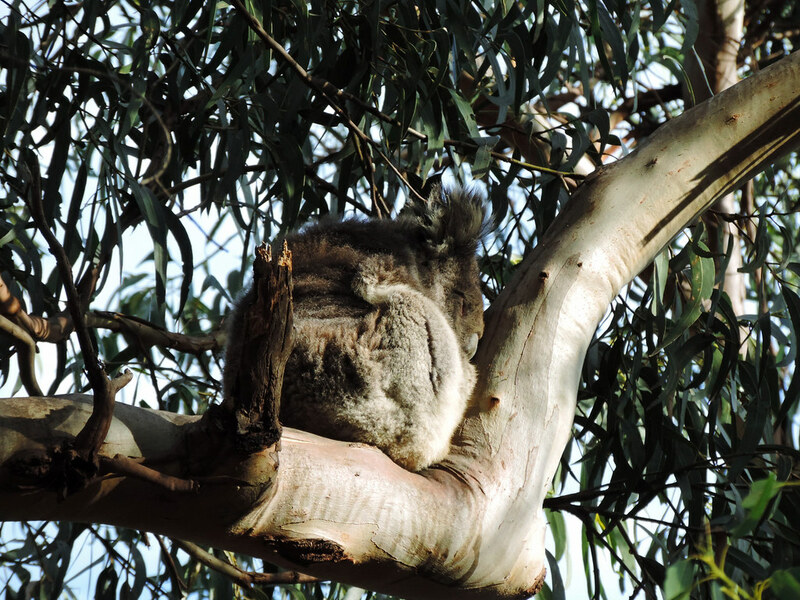 They sleep and eat in the high gum trees. That basically means they spend their life in the gum trees, since they either eat or sleep. 😛 And they sleep a lot! Like 16-22 hours a day. So you need to look up to spot them in the first place. And you need to find a forest where lots of koalas live in order to have a good chance finding some. 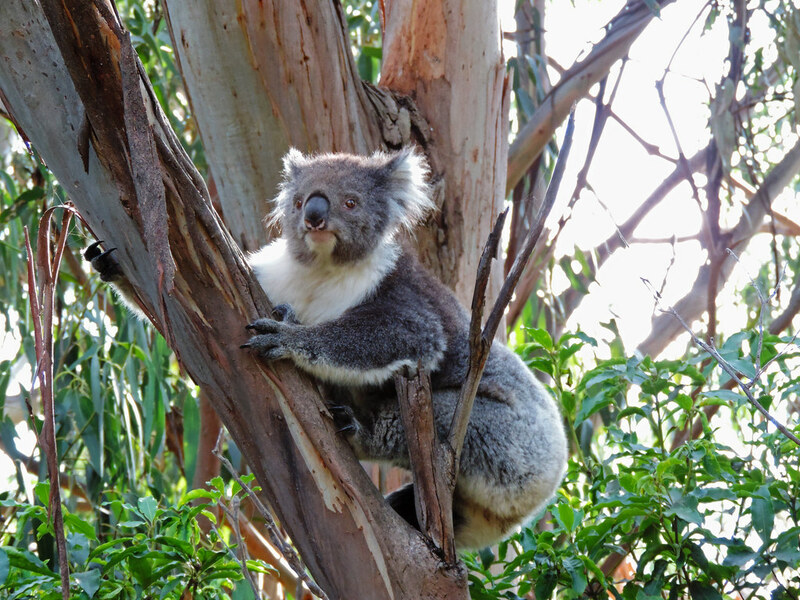 One of the most well-known places to meet them in the wild is the Kennett River Koala Walk in Great Otway National Park. 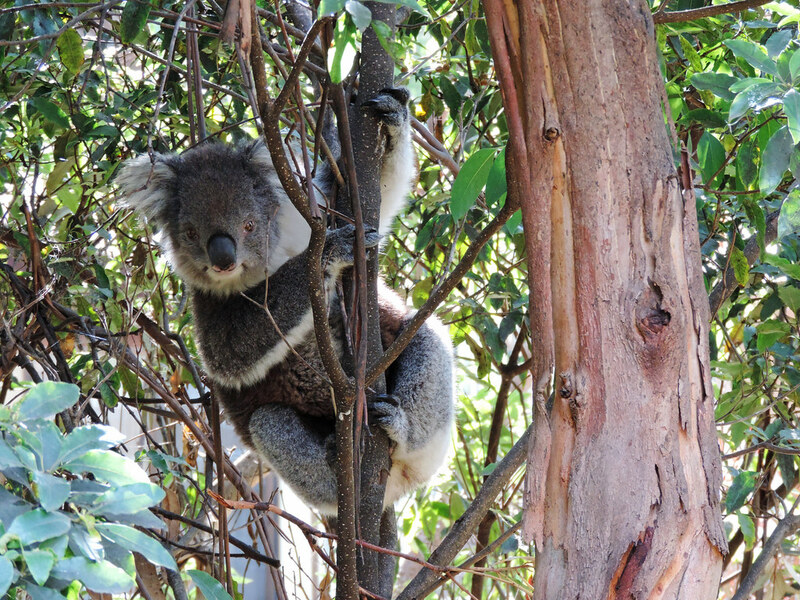 It starts behind Kennett River Holiday Park, and it takes you through a gum tree forest. Once at the holiday park, we headed for an early morning walk along Grey River Road, a dirt track that runs through the gum tree forest. 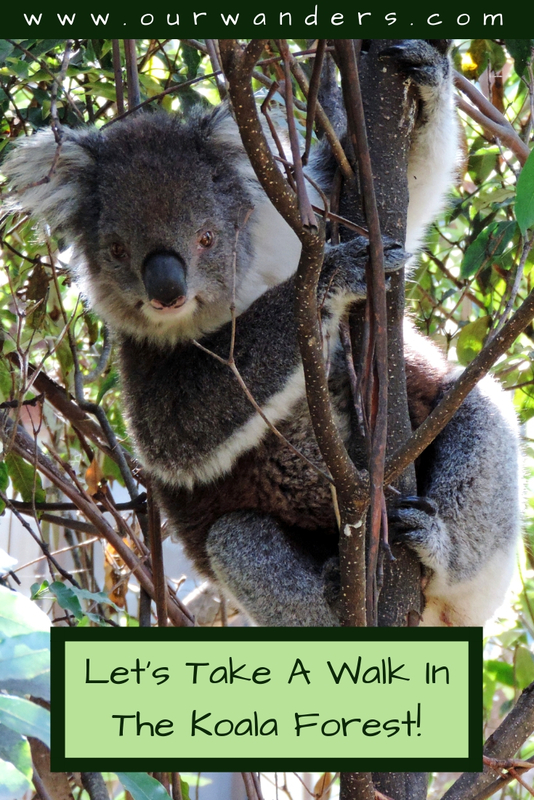 This is what’s also called the Kennett River Koala Walk. What about hugging a koala? Before you ask, we didn’t hug him. Not because he was not cute enough (awh…he was). But you can’t just hug wild animals. Nor feed them. If you really love them so much, then you observe them from a safe distance – and that means they should feel safe, too, not only you. All in all, Great Otway National Park was worth a longer stop during our road trip along the Great Ocean Road. Koalas are definitely one of the reasons, but there are more. This national park is home to a temperate rainforest. We enjoyed the shorter and longer walks in this wonderful land of lush green ferns, large trees and waterfalls. We even found a small forest of Californian Redwoods. 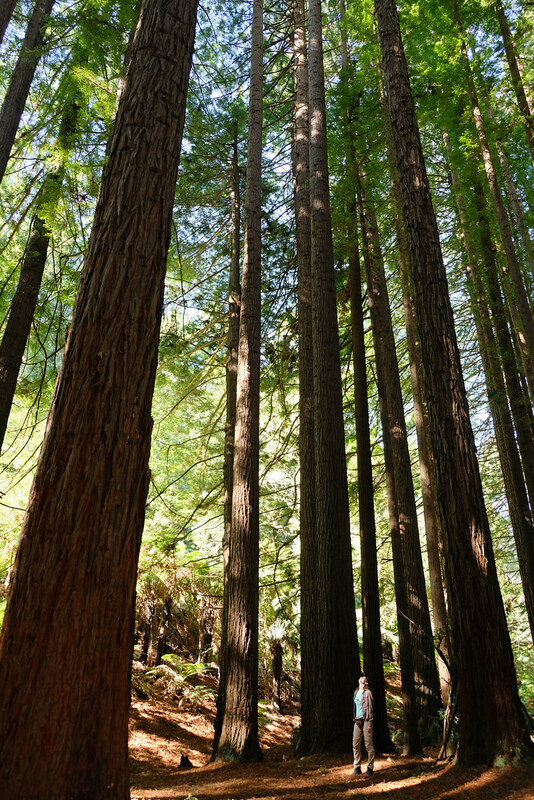 These trees are the largest of their kind: the tallest trees on Earth. Of course, being only a couple of hundred years old, the Otway Redwoods are babies compared to those ancient giants we’ve seen in California’s Redwood National Parks. But let those babies amaze you, they will. Have you ever seen koalas in the wild? Where?